Mission Valley (San Diego) residents have numerous options regarding storage companies. There currently are seven different self-storage companies in 92108. However, none of those companies provide the storage value for Mission Valley residents. 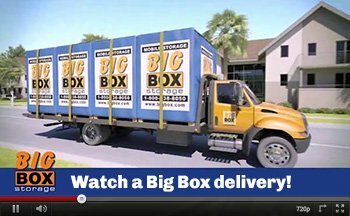 Big Box Storage San Diego delivers complete convenience in the form of storage unit delivery and pickup. And their services are backed by a 110% low price guarantee. Simply stated, if you were to find a better rental rate at any of the above-mentioned storage companies in Mission Valley (or any other storage facility in San Diego), Big Box Storage will gladly beat that rate by 10%. 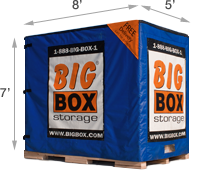 Rental rates for a "Big Box" start at only $64 per month. The offer also extends to Tierrasanta, as well as to the rest of San Diego county. The size of each Big Box is 8' x 5' x 7' (length, width, height). Each one, approximately, will hold the contents of up to 1.5 rooms. Please feel free to use the storage space estimator should you need assistance figuring out how many Big Boxes you might need. Note that the company will only charge you for the number that you use - not necessarily the number that you have delivered to your Mission Valley home. For example, if you're questioning whether you may need one or two Big Boxes, it's best to have two delivered. In the event that you don't end up using the second Big Box, you won't be billed for it. Once you've loaded the Big Box(es) at your address, it will be picked up by a company driver and transported back to the company's secure storage facilities located approx. six miles north of Mission Valley. Should you ever need to get into your unit while in storage, you can do so on any day of the week you wish. Delivery and pickups are available on any day you wish (Sundays included). If you should need a same-day delivery, simply contact the Big Box Storage by 4pm and a Big Box will be delivered to you before 7pm that day. Pure convenience. To schedule a Big Box delivery, please call 619-436-5020 or schedule online via the scheduling form.